The Best Fun Day You've Ever Had! Our traditional Victorian chestnut barrows are operated by staff dressed in the Victorian era serving hot roasted chestnuts on an open fire in our opinion is the best way to cook chestnuts and creates a great atmosphere. We operate electric and gas ovens. 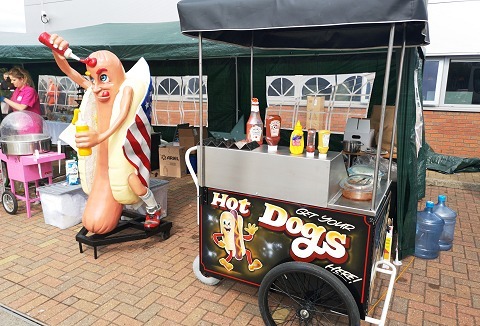 We are proud to offer you one of the finest German sausages on the market today from American, chilli hotdogs, cheese hotdogs or good old with onions. We even bring our 6ft hotdog statue for fun photos. 5* hygiene rated, public liability, gas certificate.